Charles Sobhraj, one of the world’s most notorious serial killer celebrities, also known as the “Bikini Killer’ and the ‘Serpent’ was convicted for murder in 2004 in Kathmandu, Nepal. Prior to his conviction I spoke with one of the allegedly scariest men alive, as well as his captor, police officer Ganesh K.C. who had no doubt about Sobhraj’s guilt in the country’s worst tourist murder. Deputy Superintendent of Police, Ganesh K.C. sipped his first cup of tea and looked out over the morning bustle of Durbar Square, the heart of Kathmandu. He had reason to be pleased. In September 2003 he arrested the prime suspect in Nepal’s worst, and to this day, unsolved, tourist murder. According to Kathmandu police, Charles Sobhraj drugged his two victims, then stabbed them and partially burned them, before dumping the bodies in two seperate locations, one near Kathmandu airport and the other in a field near the UNESCO World Heritage Site Bakhtapur. Charles Sobhraj is a household name on the Indian subcontinent. Parents warn their children that Sobhraj will eat them if they are unruly. His reputation is deservedly brutal, if even a fraction of the stories attached to this man are true. Charles Sobhraj spent more than twenty years on the road across Asia befriending backpackers, drugs-smugglers, diplomats and businessmen, then allegedly drugging, robbing and finally strangling or burning his new acquaintances. The sixt-year old has been on the run from police in Hong Kong, Thailand, Nepal, Pakistan, Afghanistan, Iran, Turkey, Greece and France. Sobhraj, son of an Indian textile merchant and a Vietnamese woman, had a tumultuous childhood. The stateless adolescent grew up on the streets of Saigon and in juvenile prisons in France. Neglected by his family, Sobhraj moved effortlessly from petty crime to armed robbery and finally to murder. By the mid-1970s, a career that included jewelry theft, luxury-car smuggling and massive gem stone fraud was interspersed with kidnappings and torture of drugged foreigners. In South Asia, Sobhraj has long been known as the “Serpent’ for his mastery of disguise, his multiple identities and his ability to persuade people to assist him with his alleged killings. With the help of several female assistants, Sobhraj allegedly poisoned his victims and then pretended to help them recuperate, while administering more poison. The Thais charged Charles Sobhraj with five murders. Autopsies after exhumation revealed one of the girls in Pattaya had been drowned, the other strangled. Charles Sobhraj was also charged with the murder of a Turkish man, the boyfriend of one of the girls, who had been burned alive. With evidence provided by several embassies, the Thais also investigated Charles Sobhraj for the murder of two Dutch tourists – Sobhraj had used the Dutch man’s passport to escape to Nepal. The Dutch couple, who had been staying in Sobhraj’s apartment in Central Bangkok, had been kept prisoner, drugged, beaten, strangled and burned to death. They were found in a ditch near the capital. Charles Sobhraj was eventually convicted for two murders in Thailand in 1976, which earned him the name ‘Bikini Killer’, but by that time he had long left the country. The world closed in on Charles Sobhraj in 1976, when he poisoned a group of French students, as part of an elaborate gem scam at the Vikram Hotel in Delhi. For once, Sobhraj got it wrong and miscalculated the dose for the students who became immediately and violently sick. Some of his victims realised they were being drugged, wrestled Mr Sobhraj to the ground and held on to him until he was arrested by Indian police. This time there was no getting away. Charles Sobhraj went to court in Delhi. By 1977, Thailand had issued a murder warrant for Sobhraj. Nepalese authorities also wanted to interview him about the two backpacker-killings (though he was not charged in Nepal until 1986). The French wanted nothing to do with him, as he had been exiled many years before. The Indians charged him with murder, for killing Jean-Luc Solomon, a backpacker he had allegedly poisoned. In 1977 a court in Delhi found Charles Sobhraj guilty of administering drugs with intent to rob, causing hurt to commit robbery and the Indian equivalent to manslaughter — culpable homicide not amounting to murder. 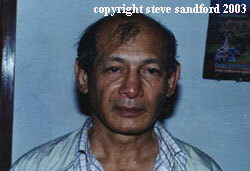 Charles Sobhraj was sentenced to seven years for the manslaughter and an additional five years for poisoning. He was sent to the notorious Tihar Jail in Delhi, which he soon ran like a company, controlling business within the prison walls, paying off guards and enjoying freedoms no other prisoner could hope to attain. In 1986, just prior to his release, he escaped by drugging guards and prisoners alike at his birthday party. A few weeks later he was recaptured in Goa with a weapon. Charles Sobhraj was keen to avoid extradition to Thailand where he would have faced the death penalty. In 1997, after numerous hunger-strikes, escapes and recaptures and twenty years behind bars in India, Sobhraj was released and returned to France where he embarked on an apparently profitable career as a killer celebrity, signing film deals on his life. In late September last year, the Himalayan Times, a Nepali daily, reported that Sobhraj was in Kathmandu. Shortly after, Deputy Superintendent Ganesh K.C. arrested Sobhraj at the Royal Casino. Old files were dusted off and the case of the backpacker murders was reopened. After just six years of freedom, Charles Sobhraj was back inside. In the derelict and noisy visitor’s cell of the Central Jail, Charles Sobhraj presented his case with quiet intense enthusiasm. With the help of a personal organizer he embellished his story with minute facts and names, at times quoting from the books that have been written about him. A social animal to the last, Sobhraj was just as eager to talk about his case, as he was to convey his impressions of life in the crumbling, freezing-cold jail. Sobhraj, a deadly relic of the swinging 60s and the roaring 70s, wanted to be remembered. He enjoyed daily encounters with sycophantic fans, he was amused by the press coverage and he narrated glimpses of his extraordinary life with the profound authority of the jaded expert. Indeed. And the very comfort Mr Sobhraj took in this fact made him the creepiest celebrity in town. Indeed, security was tight. During interviews no less than five security officers watched over their prized inmate. Charles Sobhraj has served his time in India, is no longer wanted in Thailand, but has now been convicted for murder in Nepal. He received a twenty year sentence. His appeal in 2005 failed. But the illustrious career of Charles Sobhraj may not have come to an end yet. While he is not currently wanted anywhere else, the Dutch embassy in Malaysia has mentioned his name in connection with the disappearance of a Dutch citizen in early 2003. Escape seems to be the serial killer’s only hope to taste freedom again. Postscript: In 2009, Charles Sobhraj was still in jail in Kathmandu and had just gotten married to a young Nepali woman. Photographs by Steve Sandford. Published in Penthouse, Bizarre Magazine, Vimen and The Nation. I read Sohbraj is still in prison however, due to the recent (2009-current) number of “mysterious” deaths by poison in Thailand and Viet Nam (see face book page Protected Travels); his name was the first I thought of when I heard the story. These recent deaths are so like what Sohbraj did (along with his brother), it’s scarey. Could these be copy cat killings? Dear Sondy, Thanks for your post. I am not familiar with the deaths in Vietnam, but the recent tragedy in Thailand has nothing to do with Mr. Sobhraj, nor his pattern of killing. The two Canadian girls tragically ingested a lethal cocktail which is all too common amongst teenagers in Thailand. The deaths in Chiang Mai a few years back have been traced to chemicals used by overzealous hotel staff. In the light of the available evidence, your comments almost sound like wishful thinking.